Jimmy Zenevitch (6’7″) dominated the glass and collected 21 points in limited playing time. 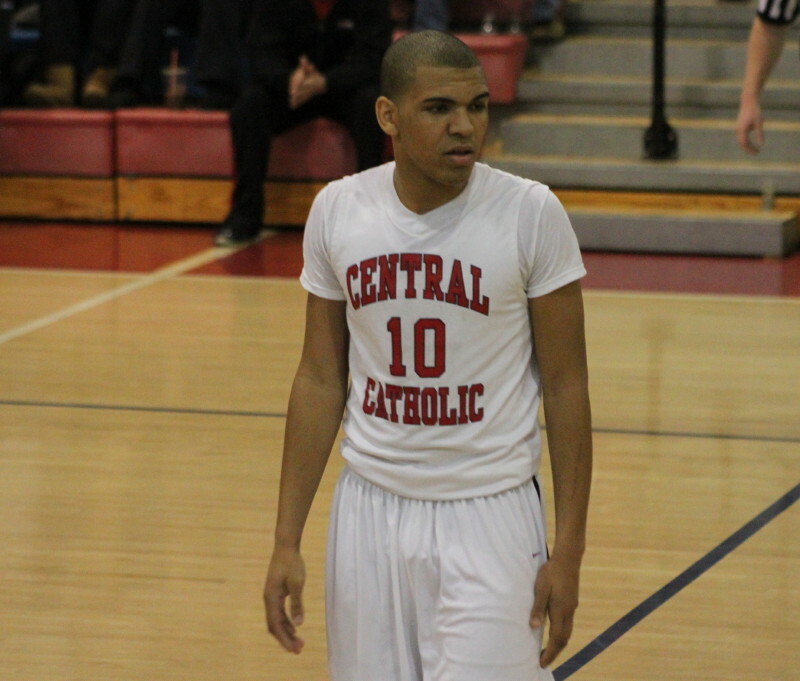 (Lawrence) Central Catholic blitzed Bishop Hendricken at the start of each half and cruised to a 69-44 victory on Sunday afternoon. The Raiders last loss was February 8, 2010 against these Hawks. Maybe that had something to do with the very noticeable defensive intensity the home team displayed. CC (14-1) had a tough win over Lowell (66-60) on Friday night but had more than enough weapons and energy to handle the visitors from Warwick, Rhode Island. They’ve now won ten straight. The Hawks (9-6) have been state champs in Rhode Island for six straight seasons. From what I saw today, getting the seventh straight will be a struggle. The Raiders ran perpetual defense at BH and dominated the boards completely. Jimmy Zenevitch (21 points) led all scorers and had an easy time of it with limited minutes getting seventeen of those points in the first half. BH was in trouble quickly in this one. In the first three minutes the Raider defense forced four turnovers and turned up high percentage opportunities down the other end. Luis Puello, Evan Sheehan, Jaycob Morales, and Jimmy Zenevich were scoring parts to a fast, 13-2, breakout. BH trailed 18-6 after a quarter still struggling to get any sort of high percentage shot off. However, they did find some long-range accuracy in the second quarter with two 3’s from Lee Messier and another one from Rory Temkin. 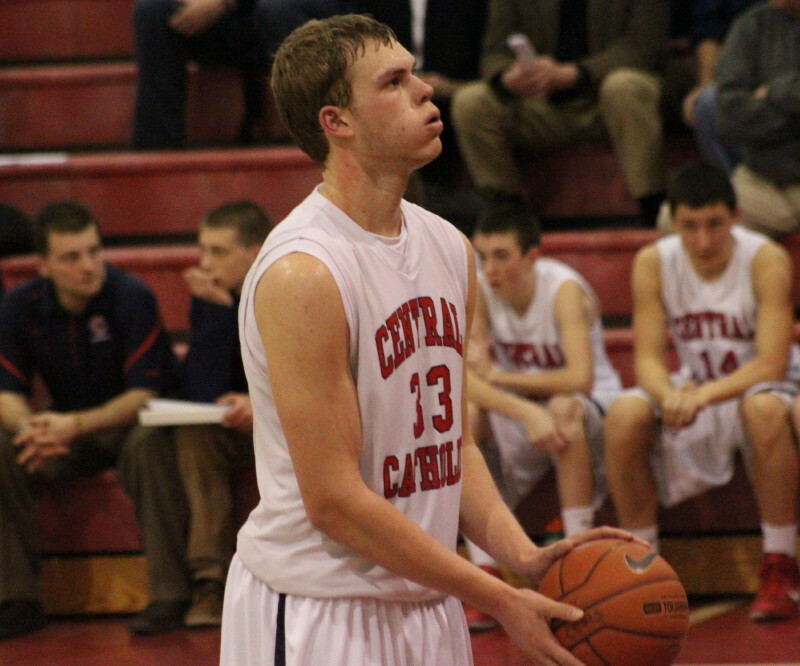 The long-distance offense narrowed the Hawk deficit to 23-15 three minutes into the second quarter. Teams live and die long-range. 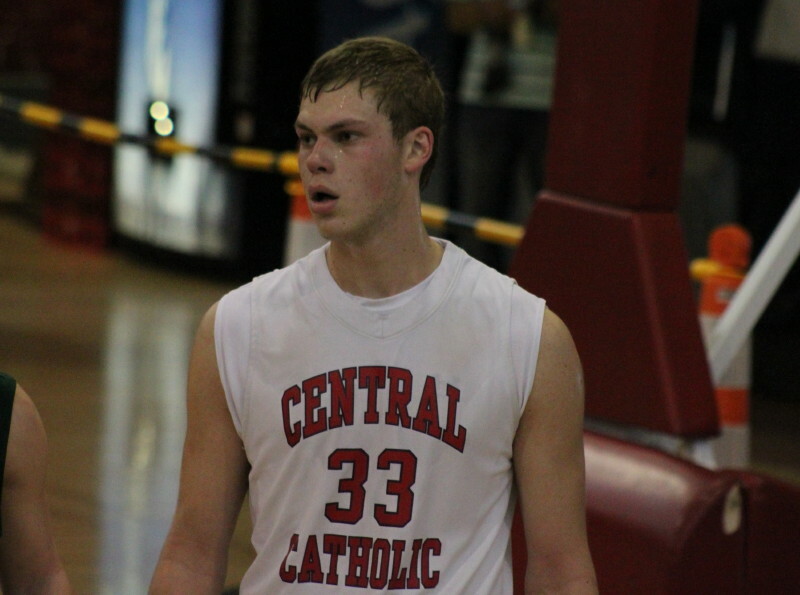 While BH missed their next three 3’s, Catholic Central ran eight straight on three’s by Tyler Nelson and Evan Sheehan and a Jimmy layup. Back the lead went to 31-15. CC led 36-20 at halftime. The Raiders went off on another both-ends blitz in the second half. In the first 2:45 the home team, led by Luis Puello’s seven points, dumped eleven straight on BH. That surge put BH down 47-20 and out. 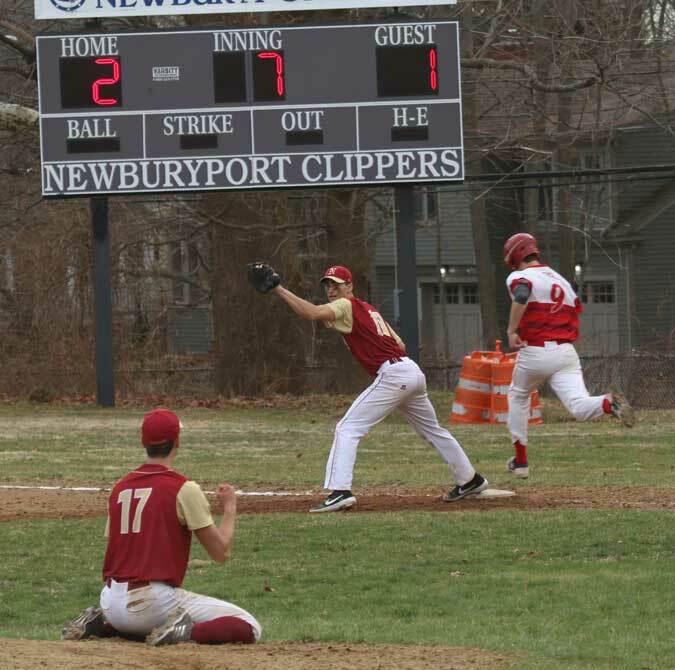 BH outscored CC, 24-20, the rest of the way as both teams gave reserves playing time. Luis Puello (13 points) had eleven in the second half. 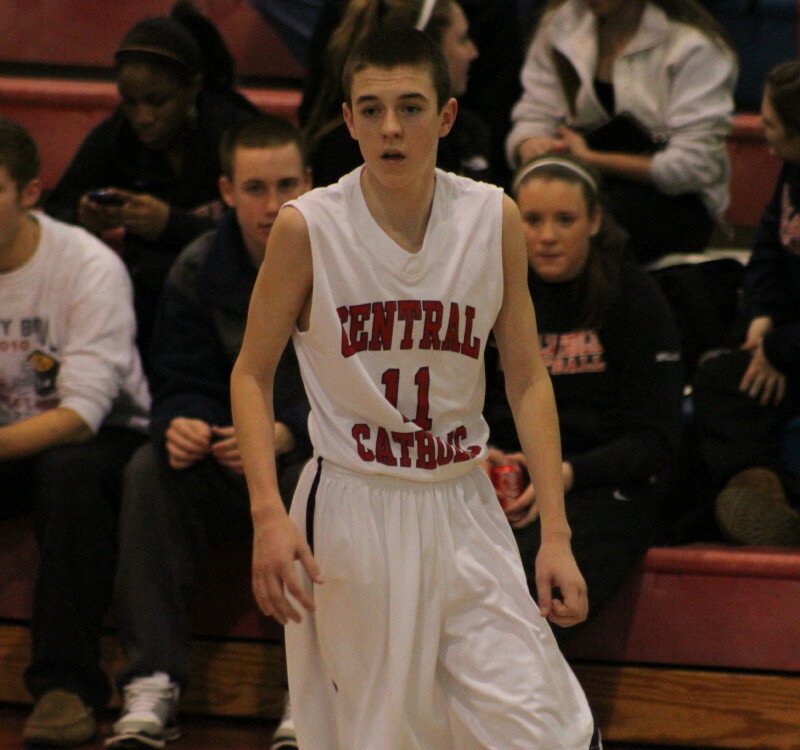 Sophomore Lee Messier (13 points) was the lone bright spot for BH. 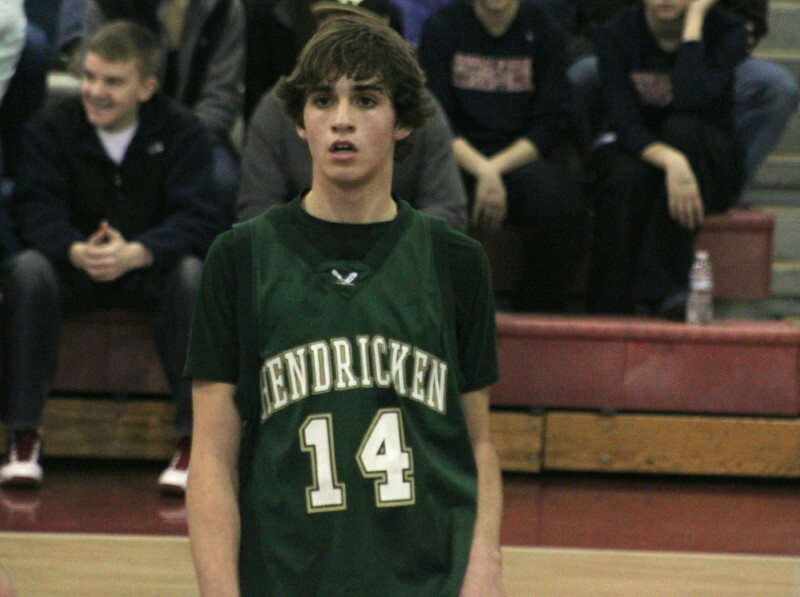 Sophomore Lee Messier (13 points) led Bishop Hendricken. 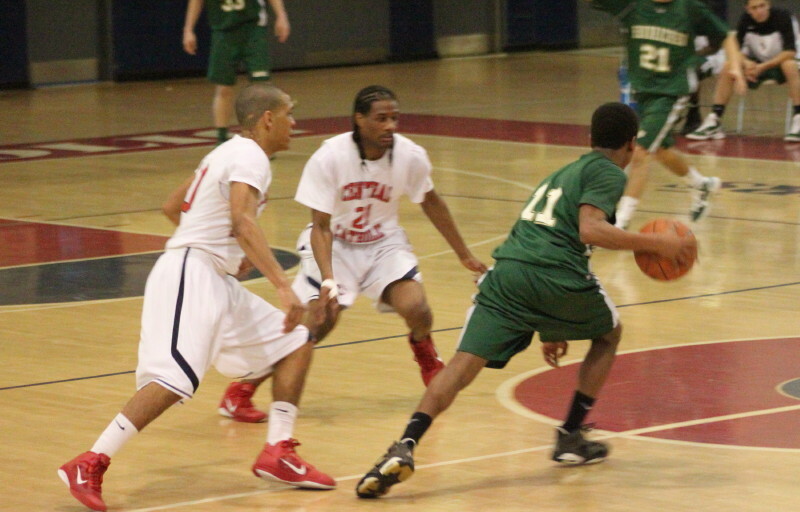 I came away very impressed with the defense of Central Catholic. They just wouldn’t allow any straight paths toward the basket. They were all over dribblers and pass receivers. They forced twenty-nine turnovers. BH used zones with an eye on Jimmy. When he moved to the corner there were all sorts of opportunities for teammates in close. The rebounding was impressive. 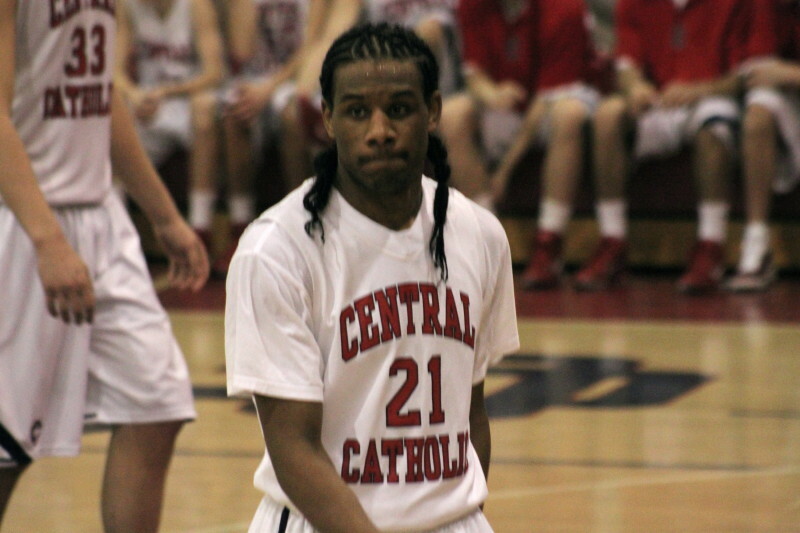 By the time CC had the 47-20 lead early in the second half, the Hawks had gotten only one second shot! That’s covering the boards. I was impressed with the routines of the CC cheerleaders. They were excellent gymnasts. Their tosses were spectacular in my non-schooled opinion. Jimmy Zenevitch will play for Division 2 Assumption next season. 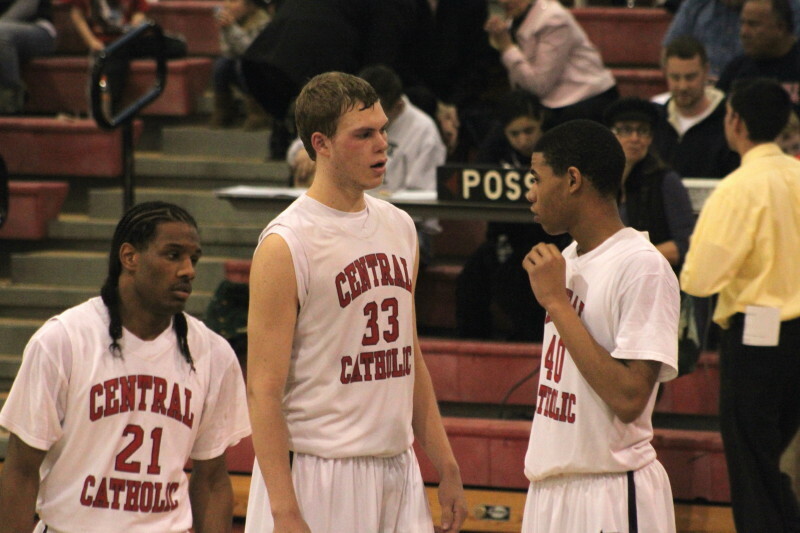 I visited CC last year when they hosted Lawrence. Much thinner crowd this time. Some folks probably knew that the Celtic/Laker game had the same start time today as the game with Bishop Hendricken. Where’s the school loyalty?